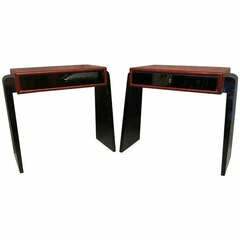 Pair of night-tables from the midcentury. All veneered in maple wood, with top covered in parchment leather. The top does not have a linear pattern, but on the two front corners it forms two pleats. Its design is very special because it has doors that are slightly larger than their space, and come more under and more lateral. The four legs are slightly arched and in the lower part it has a brass foot. Internally the space remains usable because it has no shelf. Two small arches brass allow the opening of the doors. Wear consistent with age and use, however, the item is in perfect condition because restored. For each piece, before the departure, a revision is redone, to make sure it arrives in excellent condition. Quotation for shipping by sea, packing with wooden box, door to door, all-risk insurance. NYC: 550 euro. Los Angeles: 700 euro. Chicago: 600 euro. Miami: 650 euro. San Francisco: 700 euro. For other destinations and / or other types of transport, quotations may be provided from time to time. Pair of bedside tables in rosewood with opaline glass on the top, drawers with marquetry detail and brass handle and auxiliary shelf in curved wood and glass.